Direct Door Hardware Customer Comments. 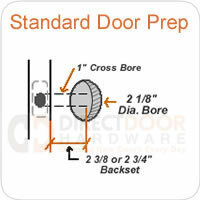 I am VERY SATISFY with the product and the services from directdoorhardware.com. AAA+++ FAST SHIPPING ! EXCELLENT CUSTOMER SERVICE !!! I will recommend to anyone !!! THANK YOU ! I have never ordered any door hardware before and had lots of questions...your staff told me exactly what I needed to know and gave me great suggestions. excellent products and service. thank you so much! Website is very nicely done. Service is very poor. It should not take 4 days from order placement to shipping of a single item. I will not use this vender again due to lag time from order placement to shipping. We are very happy with our doorknob. It was delivered the day after shipping. Outstanding service, order was shipped extremely quick, keying of all 8 tumblers was without a problem, even supplying keys for newly keyed locks. Great price,fast delivery on my order.Schlage deadbolt and hand levar looks good on my new security door.bought oil rubbed bronze,perfect match. will order agian for my future needs. Phenomenal customer service and the best prices on the net; the combo I ordered was a custom order on other sites, but was in-stock at directdoorhardware. RMA handling was flawless as well when we ordered the wrong doorknob. Fantastic service. From order to delivery in just 3 days. Product was exactly as described. Your service is great and I'm a very satisfied customer - and a repeat customer too. I am blown away by your service. I ordered a Schlage door lever yesterday, and it arrived this morning before 10am. What fabulous service! Thank your for your reply, I received my pulls yesterday, Mon. You were most helpful and very efficient and would use your company again. I really appreciate the great customer service - thanks so much for your help! Hello. I received my door hardware order today. THANK-YOU! IT'S ALL BEAUTIFUL! ordered wasn't in. I'll return the one I don't use. thanks again. I'll recommend you highly to friends and family. I wanted to express my thanks and gratitude not only for the quality of the product we purchased (Weslock Provence Lever Handle) but the service after the sale handling the key miss match. The locks are a breeze to install and I like the ability to change the latch center on the fly. Every lever set works consistently and easily without further adjustment required. The product has a nice weighted feel not cheap to the touch. Again, I'm very thankful because you just don't know what can happen when purchasing over the internet. My wife and I had a hard time finding a lock set we liked for the price at our local stores. I'll buy again and tell my friends.
. . . I WOULD like to add that your prices are outstanding! I do a lot of remodeling and rehabbing and you can bet if this transaction goes off witout a hitch I WILL be back. You cannot beat the prices. Most places either have excellent service OR excellent prices. When I find a company with excellent prices and excellent service I'm a valued customer. I must say that because of your products, I have an absolute one-of-a-kind home. We love all of our hardware, from the doors to the cabinets! We have been searching the web for ways to streeeeeeeech our limited budget dolars and still get the look we really want. Let me just say your web site is fantastic!!!!!!!!! We were so happy to have finally found a usable, upfront pricing, and realistic shipping rate site!! We will definetly have to tell our Builder and Contractors about your site (They do Custom homes and Restoration work.) I am positive they would love to use your products instead of going to the Local home Improvement stores. You are MUCH less expensive! Thank you for the quick delivery. Those pulls, handles and knobs looked beautiful in our kitchen. A very pleasant experience! The doorknobs arrived yesterday and the are fabulous! You've helped me so much over the last several weeks, I deleted all other hardware bookmarks from my address files. My ordering ease could not have been better, the email reciept was prompt and totally accurate! I can't wait to unwrap my beautiful new door knobs! Thanks Again! I look forward to getting the hardware. You have a great website, and fantastic prices. Thanks again for your professional customer service. I'll recommend you in a heartbeat! I'll be sure to pass your site on to my contractor. With your great prices and excellent customer service, how could anyone go wrong ordering from you. Your company has been great to work with and I absolutely love the product! I needed to add that I really appreciate the custumer service your firm offers. Thanks so much! You guys are great! I recommend you to everyone I know! Thanks for your great service and prices! I never got a chance to say Thanks! So, here… Thanks!!! The new unit worked out great! Thanks, I appreciate your help with getting this taken care of. Nice company to deal with. You guys know how to keep a customer! I very much appreciate your help with this and rest assured I will be telling friends about your site and excellent service! thanks again for the fast and friendly service! We may be renovating another property this summer, and I know where I’ll be buying the door hardware. Thank you for your prompt response. You have one of the best websites I have been to. Very easy to navigate and successfully order. Thanks so much for shipping the door hardware so quickly! Your site was very helpful!!! Your company is great! Your excellent and prompt customer service will surely have me coming back again as I continue to renovate my home. Thanks again. Lately I have been really jaded with retail companies, but dealing with direct door hardware has been quite pleasant. We received our order today. We LOVE the hinges AND the bi-fold door pulls!! We'll be ordering all the hinges we need as soon as we get our count together! Thanks so much! Hi: We received our order last week for the Sure Loc satin nickel door hardware we ordered. We have replaced all the tacky brass door hardware in our home with the items we ordered from Direct Door Hardware. The upgrade to satin nickel really makes a difference. We love it! Thanks so much for the prompt service and great pricing. Thanks so much for your patience... everything came in perfect & we really appreciate all of your help. Will definitely have to tell others about yall! Just received the replacement part, installed it and the lock is working perfectly. Your customer service is the greatest. Thanks again for all your help. It is great doing business with people like you! Just wanted to write you all a quick note of thanks. I received my order from you yesterday and the hardware is perfect! Thanks for the quick shipping and fast service. As soon as we save a bit more money, we'll have another order to do the hardware on the 2nd floor of our home. Thanks for the great follow up. I look forward to getting the hardware. Just wanted to thank you for the phone call and e-mail. It's not often we get such excellent service.